Hallmuir Ukrainian POW chapel survives as a living memorial to over 400 Ukrainian prisoners of World War II. The Hallmuir Prisoner of War Camp was built in 1942 to accommodate 450 German and Italian prisoners of war. After the end of World War II, the Italians and Germans were repatriated and by 1947 the camp stood empty. Later in that year, it became home to over 400 Ukrainian conscripts. 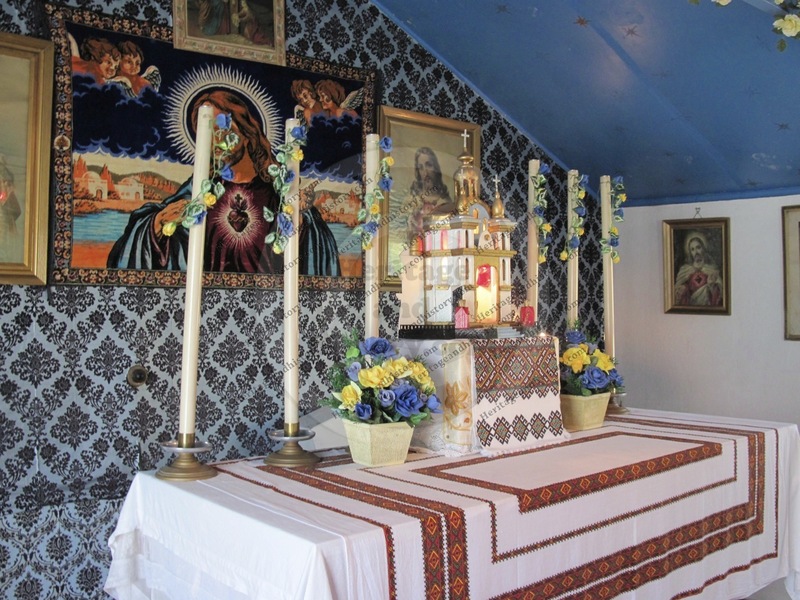 One of the huts which had once been used by the Italians as a place of worship, was transformed by the displaced Ukrainian men, into a colourful chapel, to allow them to continue to celebrate their Greek Catholic faith. The Hallmuir chapel is one of only two remaining POW chapels constructed in Scotland during the second world war, the other being the famous Italian Chapel in Orkney. During World War II, hundreds of Ukrainian men were forced to join the German army or see their families and villages destroyed. The 14th Galica division of the Waffen-SS was formed purely from Ukrainians in 1944, to fight the Russians at the Battle of Brody in July of the same year. Ukrainian men taken as prisoners of war by the British in Italy, remained in Rimini until 1947. Previous repatriations of Soviet citizens in 1946 had resulted in instant death by firing squad or a slow death in the Siberian labour camps. Following an appeal for leniency by Pope Pius XII, the Ukrainians at Rimini had their status changed from “prisoners of war” to “surrendered enemy personnel” and were offered the option of being settled in the UK or in Canada. Several thousand chose to come to the UK, and on May 15th 1947, the troop ship India Victory docked at Glasgow. Over 400 men were sent to the Hallmuir camp at Lockerbie, where many were employed locally in farming and forestry, by the Ministry of Agriculture. By joining the German army, these men sacrificed their right to ever see their families or home country again. Treated as traitors by being forced to fight against their own country, they would have been executed or sent to Siberia. So, Scotland became the new home of many of these young men. It was only when the Ukraine received independance from Russia in 1991, some 47 years later, that any of the men dared to set foot back in their home country. One of the prisoners brought three matchboxes full of seeds from Rimini in Italy and around the Chapel can be found a number of apple trees, as displaced from their country as the men themselves. An apple tree stands tall, shading the area where a memorial is erected in memory of those who died for freedom and a garden of remembrance for the Lockerbie air disaster. Over the years, artifacts have been gathered from around the world to decorate the chapel, in which Greek Catholic services are still held and attract worshipers from a wide area. The chapel has seen a service held by the Ukrainian Bishop in London, during his visit to Scotland and to keep up with tradition, the local Mr Pufkyj, a son of one of the prisoners, was married at the chapel in 2002. The ceremony was conducted in Ukrainian and Scottish. Follow the M74 north from Gretna and take junction 18 towards Lockerbie. Turn left at the first roundabout and take the Dalton Road. The POW chapel can be found about 1 mile on the left. Admission is free, all year round and you will be warmly greeted by Mr Pufkyj and his wife, who are more than eager to share the stories and history of the chapel and the camp. Enjoy a cup of tea or coffee whilst you browse through the collections of documents which have been thoughtfully and carefully collated to give a more detailed insight into the lives of the Ukrainian men. The Chapel has recently been given protected status by Heritage Scotland, which should enable it and its history to be preserved for generations to come.